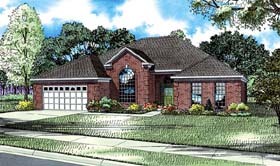 Among the eye-catching features of this four-bedroom plan are decorative quoins, tall hip roof line, and a huge arched window. Inside you will delight in the relaxing atmosphere of the great room featuring a grand fireplace and 9' boxed ceiling. The spacious kitchen allows for casual dining options at the functional snack bar or in the adjoining bay-windowed breakfast room. An elaborate master suite located away from the secondary bedrooms allows you to relax in comfort and privacy.